The duo originates from the precious musical experience of the years of study under the lead of Ruggero Chiesa at the Conservatory of Music in Milan. Subsequently, the two musicians have developed their profession along separate ways. Ester Poli has broadened her concert activities especially in Northern Europe, while studying in depth the local musical traditions. During her prolonged stays in Norway and Denmark she has worked with prominent personalities of the guitar scene, both composers and players. Leopoldo Saracino, Professor of guitar at the Conservatory of Music in Monopoli (Bari), performs both in Italy and abroad, especially in Germany, where he lives. 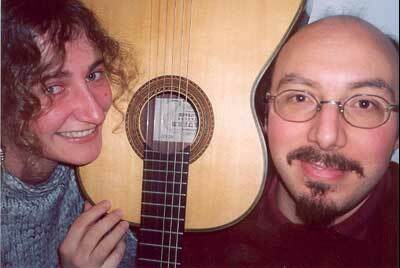 For a few years now the duo has been actively engaged in concerts in Italy and abroad presenting the traditional guitar repertoire. At the same time, thanks to the musical experience in Northern Europe, greatly enhancing contemporary arts, the duo has become involved in several projects set up together with other musicians: a tour of Scandinavia, the Baltic Countries and Germany; a close collaboration with other musicians; the recording, still in the making with some Danish ensemble, of a CD dedicated to the music for guitar by a great living Lithuanian composer. 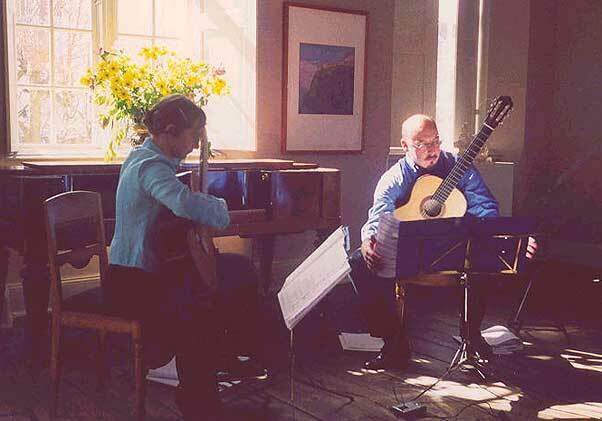 "There was good collaboration between the performing couple, with much understanding and communication ensuring a stylish presentation of the work......the guitar duo rightly indulged in a greeter flexibility of tempos and in a broader variety of moods and accompanying dynamics”. ...."the work’s inherent texture was very carefully analysed and subtleties in the score were brought out through detailing in shading that guaranteed finesse in a musical shape”. Leopoldo Saracino was born in Milan in 1965. He studied with Ruggero Chiesa, at the State Conservatory G.Verdi in Milan until 1986. Since graduating he has pursued a varied career as a recitalist, concerto soloist and chamber musician. Subsequent studies have been with David Russell. He won several international competition, such as the international competition "M.Giuliani", The International Prize of Contemporary Music of Lagonegro and the Scandinavian International Guitar Competition. He recorded several CD, such as the complete works for guitar and fortepiano by F. Carulli and the 36 Capricci op.20 by Luigi R. Legnani for solo guitar, on the Nuova Era Records label. He has collaborated several times with the “Teatro alla Scala” in Milan. The young swedish tenor Jerker Dahlin is already very well known in Scandinavia. He has toured extensively in Europe and in the United States, obtaining great success for both his voice, endowed with vast timbric possibilities, and for his interpretive gifts and strong stage presence. The Duo features a repertoire consisting of music from both the "classical" period (for example Schubert's Lieder, transcriptions by Mauro Giuliani of Arias from Italian operas) as of beautiful traditional Swedish music (like that of K.M.Bellman). The timbric possibilities of an instrument such as the guitar, together with the warm softness of this male voice, creates an intimate atmosphere typical for chamber music. It is possible to comprehend the Duo's scenic and musical worth from viewing the video cassette and their recording of one of their latest concerts. The Duo was founded in Oslo, and has performed concerts mainly in Scandinavia. The Duo is often enriched by their collaboration with Norwegian flutist Carina Amundsen. PLAY: Schubert - "Des Müllers Blumen"
PLAY: Diabelli - "Die Nachtmusik"
The duo consists of the Italian guitarist Ester Poli and the Norwegian mandolinist Reidar Edvardsen. This quite recent group have gained great acclaim in important festivals like the 36th Festival «Plectro Rioja» 2002 in Logroño (Spain). The repertoire includes baroque music (Vivaldi and Leone), 19th cent. (Rung and Henriques), romantic Italian (Munier and Calace) and contemporary. In connection to this project, the two musicians have collaborated and will collaborate with important contemporary Scandinavian composers like Kjell Marcussen, Østen Ore, Olaf Näslund and Turi Jonsdottir to extend the repertoire.